A fast and economical way to create security areas. Rugged steel wire partitions provide long-lasting security, thanks to years of manufacturing experience. Panels...are constructed of woven 1-1/2" 10 gauge diamond style mesh clinched into a heavy 1/8" thick structural channel frame for extra strength and rigidity. Floor Shoes…High grade iron casting with set screw, plus two slotted holes for floor attachment. Anchors are included. Top Capping Channels…Are 1 1/2" x 1/2 " x 1/8" hot rolled channel. Two fasteners are provided with each channel. 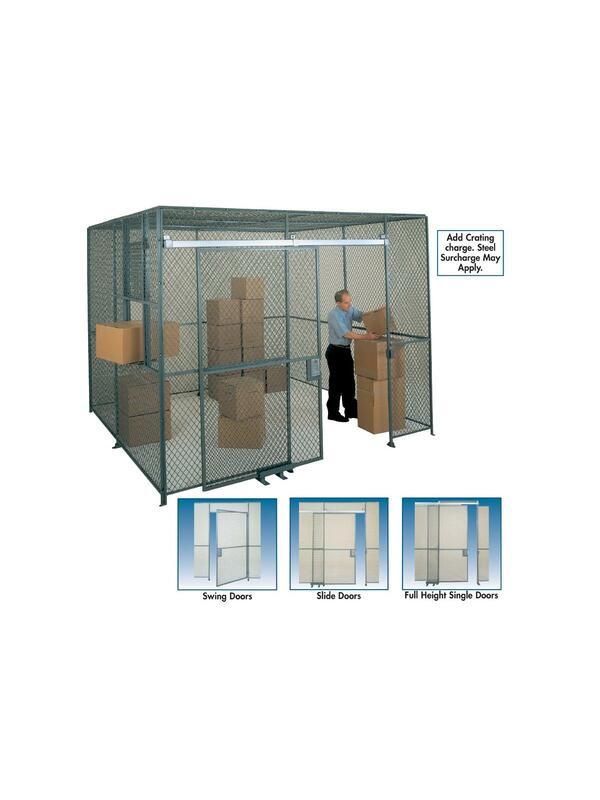 Standard Size Panels…are available in 1’, 2’, 3’, 4’, and 5’, widths; 7’, 8’, and 10’ heights. Most jobs can be planned around these even foot dimensions. Stock Hinged Doors…are made in 3’ and 4’ widths and are 7’ high with transom above. No transom on 7’ high partition. Unless requested otherwise, doors are supplied hinged left, swing out (viewed from outside partition enclosure). Sliding Single Doors…are available 3’, 4’, 5’ and 6’ widths and are 7’ clear with transom above. Full Height Single Slide Doors…are made to provide overhead height up to the height of the partitioning (8’ or 10’) and 5’, 6’, 8’ and 10’ wide. All necessary bolts, nuts, clips and floor lags included. Note: All doors complete with padlock lugs only. See Related Items tab for Accessories for Woven Wire Partitions. 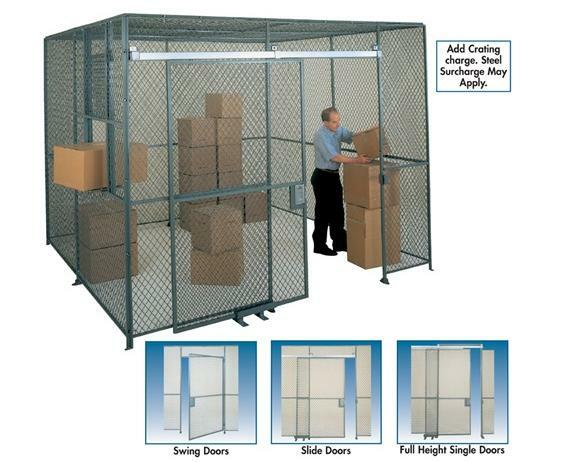 Add HWWP-CRATING per order for Crating Charge. Steel surcharge may apply. One HWWP-CRATING must be added per order.